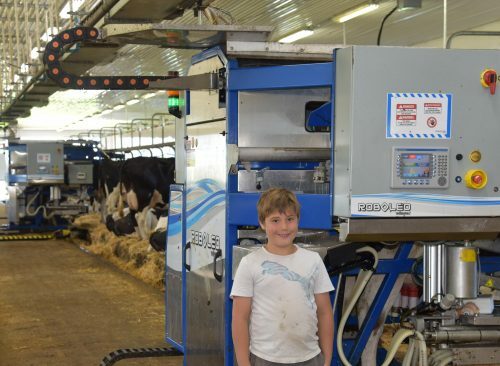 Milkomax’ Tie-Stall AMS is the only milking robot for stanchion barns. It can be adapted to your existing building and setup so as to minimize modifications to your barn. Moving from stall to stall, it allows the automation of the milking process while keeping the advantages of tie-stall barns. How does a Tie-Stall AMS work? The Tie-Stall AMS travels in the center aisle between back-to-back stalls and milks each cow one at a time. 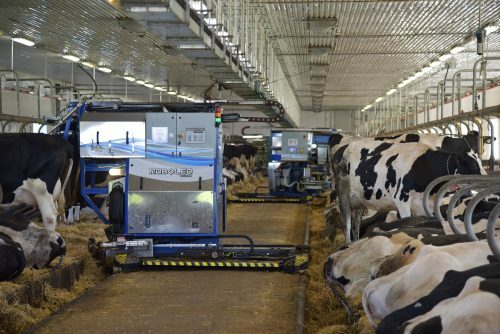 The robot repeats each step in a predictable and consistent manner, making it easy for cows to get used to the equipment and the process. This reduces the stress inherent to the milking process and results in increased milk production. 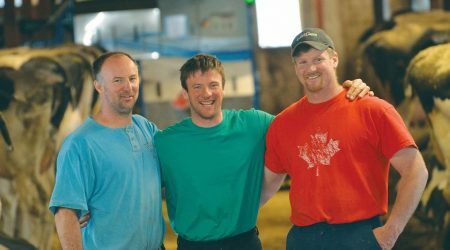 Milking is done at set times, the fixed intervals between milkings often being determined by the size of the herd. The AMS operates quietly in the barn so as to keep the herd relaxed throughout the day. Efficient: Milking and travel time between each cow takes only 7 to 9 minutes per cow. Productive: A single robot can reliably perform between 150 and 160 milkings a day, milking frequency being proportional to the herd size. Ease of adaptation: It takes between 8 and 10 days for an entire herd, including heifers, to adapt to the robot’s operation. Watchful: The AMS monitors the next cow to be milked for positioning. If needed, a device nudges the cow to get it to stand and get in position. Flexible : Teat cleaning time can be adjusted to ensure the proper preparation time necessary to the release of oxytocin hormones1. Precise : The Tie-Stall AMS individually monitors and controls milking of each quarter, virtually eliminating over-milking problems. The robot also generates warnings regarding each quarter’s milk quality. User friendly : The AMS’ management software is user friendly to allow a farmer easy management of milking and herd performance. Using a computer, a tablet or a smartphone, you can monitor and even troubleshoot the system remotely. The Tie-Stall AMS is also equipped with cameras that give you live video access to your barn and the robot’s operation.